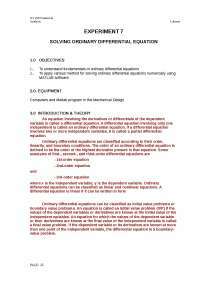 Notes on Ordinary Differential Equations. Computers and Matlab program in the Mechanical Design. 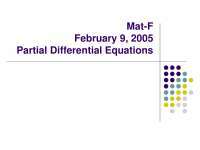 variable is called a differential equation. A differential equation involving only one independent is called an ordinary differential equation. 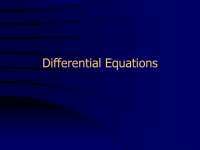 If a differential equation involves two or more independent variables, it is called a partial differential equation. 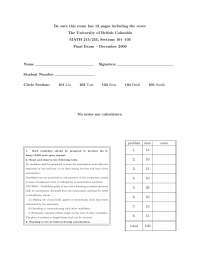 Ordinary differential equations can be classified as initial value problems or boundary value problems. An equation is called an initial value problem (IVP) if the values of the dependent variables or derivatives are known at the initial value of the independent variables. An equation for which the values of the dependent variable or their derivatives are known at the final value of the independent variable is called a final value problem. If the dependent variable or its derivatives are known at more than one point of the independent variable, the differential equation is a boundary- value problem. and exact solution is in interval 0 ≤ t ≤ 2 with step size is 0.2, using MATLAB functions ode23 and ode45. Note: To use ode23 just replace ‘ode45’ with ‘ode23’. (7.3) is known as Euler’s or Euler-Cauchy or the point slope method. Euler’s Method Procedure 1. 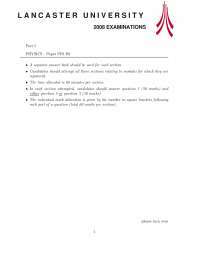 Start with the known initial condition, . 2. Choose h .
3. Click on Save As to save it as Euler.m. 4. To see how it works, type Euler in MatLab Command Window. In Euler’s method, the value of the function f (x,y), which denotes the derivative , is computed at the beginning of the interval h and is assumed to be a constant over the entire interval. This assumption is a major source of error since the derivative, , changes from point over the interval h. In Heun’s method, the derivative or slope, , is compute at two points-one at the beginning and the other at the end of the interval h-and their average value is used to achieve an improvement. which is called a corrector equation. The Heun method is a predictor-corrector approach. .1 Start a new MatLab file by clicking on File, New and M-file that opens an empty file in the Editor/Debugger window. .3 Click on Save As to save it as Huen.m. .4 To see how it works, type Huen in MatLab Command Window. where p and a are constants. We now consider three of most commonly used versions of second-order Runge-Kutta method – Heun’s method, Midpoint’s method, and Ralston’s method. 1. Start with the known initial condition, . 3. Calculate the solution at each node point by using Eq. (7.7)- Midpoint’s Method, Eq. (7.8)- Heun’s Method, or Eq. (7.9)- Ralston’s Method. 3. Click on Save As to save it as Rk.m. 4. To see how it works, type Rk2 in MatLab Command Window. for k=1:M t(k+1)=t(k)+dt; y_exact(k+1)=feval(f,t(k+1)); k1=feval(df,t(k),y_4rk(k)); k2=feval(df,t(k)+(1/2*dt),y_4rk(k)+(1/2*k1*dt)); k3=feval(df,t(k)+(1/2*dt),y_4rk(k)+(1/2*k2*dt)); k4=feval(df,t(k)+dt,y_4rk(k)+(k3*dt)); y_4rk(k+1)=y_4rk(k)+((dt/6)*(k1+(2*k2)+(2*k3)+k4)); error(k+1)=abs((y_exact(k+1)-y_4rk(k+1))/y_exact(k+1))*100; end R=[t y_4rk y_exact error] 3 Click on Save As to save it as Rk4.m. 4 To see how it works, type Rk4 in MATLABCommand Window. 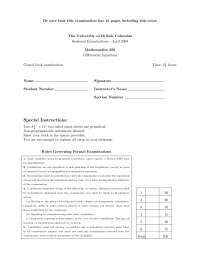 Higher-Order Runge-Kutta Methods 1. Start with the known initial condition, . f) If the solution does not change for the selected number of significant figures, that is the final solution. 3. Click on Save As to save it as Rk.m. 4. To see how it works, type Rk in MATLAB Command Window. from t = 0 to 30 s given that v(0) = 0 with step size, h = 2. During free fall, cd = 0.25 kg/m. Data Analysis 1. Fill in Table 1, 2 & 3. 2. Plot a graph for results comparison in Figure 1. Lab Name : ………………….. Pc Number : ………………….. Folder Name : …………………..
(%) 1 . . .